The Don here. Once again I have been asked to interview some of the dogs from the Bucov shelter, to hear their point of view on their life in Romania and what some of their hopes and dreams are for this year. This time I am going to be interviewing some of the elderly dogs from the shelter. We often talk about the young and the injured dogs but we often forget the elderly dogs who are just as much in need of our care and help. Many of these poor souls have been dumped by their owners simply because they got old. This is very sad. Today I will be talking to Domino, Pavarotti, Bobby, Alex, Pumpkin, Teddy, Oreo and Jones, all senior citizens living in the Bucov shelter. Don: Thank you all for taking the time to talk to me today. Pavarotti: Oh no thank you Don for wanting to talk to us …. Oreo: and wanting to hear our story. No one ever wants to hear about us old dogs. Don: So perhaps you could tell me a bit about yourselves? Pavarotti: absolutely. With pleasure. 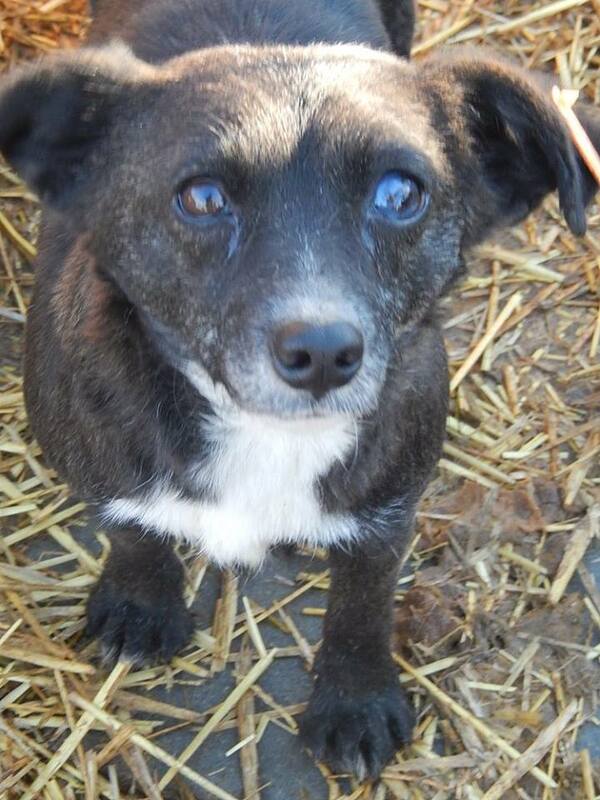 I am a little chap, with short stubby legs, and I used to belong to a family who I thought loved me. Some might say I like to have my say but I think it is important for people to hear what I, and the other oldies here, have to say. Teddy: Very true again. People need to hear about our sad story. Oreo: Yes – totally agree! As you can see some of us are healthier than others. I myself and still relatively sprite, for my age, but others like Pumpkin and Alex are not doing so well and need lots of extra support. Teddy: Of course we all need extra support as older dogs. Jones: That we do. As older dogs we are less able to cope with living outdoors, dealing with the cold and wet. It is harder for us to keep ourselves warm and we also can’t compete with the young’uns for food. Domino: Especially not smaller, older dogs like me. I’m such a little dog and frail with old age. I can’t fight for my food like the bigger, younger dogs. I have to wait and then take what is left over. Sometimes I can sneak in under their legs but I have to be careful as I am not so swift on my legs anymore so less able to run away if I get in trouble. Jones: Yes – we have to often just wait our turn. Being old also means we suffer more from the cold too. Our joints ache and hurt in the wet and cold conditions. Pavarotti: And we are not all street dogs who are used to living outside in these conditions. Bobby: Yes – I am still a healthy chap just getting on a bit. I used to have my own family, who took me for walks and kept me safe and warm. Don: That sounds really tough. As an older chap myself I can imagine how uncomfortable and miserable you must be living outside with all that cold weather, and wet cloggy mud. *Don shivers at the thought* now tell me then – how did you end up in the shelter? Pavarotti: Well you see Don the sad thing is that for some people an elderly dog is a burden or no longer of any use, so they just throw us out like rubbish. Bobby: My family decided that they wanted a puppy and I had served my purpose – they had no room in their homes or hearts for an old dog like me anymore. Don: OMC that is terrible! How could anyone through a poor dog out at a time in their lives when they need a warm loving home most?! Jones: Sadly it is true. Some of were “lucky” in that they just dumped as at the gates of the shelter, but others were not so lucky and got dumped on the streets. As pets we are not equipped to live and survive on the streets I tell you. Domino: Oh heavens no! The shelter isn’t much better but at least here we have shelter and get some food. Teddy: Never enough though if you ask me! Oreo: I miss my family – I thought they loved me I did. I lived with them for years and then now, when I really need them, they just dumped me. I don’t know what I did to upset them so they would want to throw me out. Don: I really am so saddened to hear this. Now what about Alex and Pumpkin? We haven’t heard much from you. You guys though are clearly not doing so well. Alex: No. I hate it here. I am so scared the whole time, and I just try to stay in my kennel as much as possible. Alex: Yes. I have been having to survive on my own for quite some time and as an old dog, like the guys already mentioned, I can’t compete for food and shelter against the younger, street-savvy dogs. I haven’t had a decent meal in a very long time. There is food here but not enough and often the younger dogs get to it first so I just get scraps. I am too scared to come out for my food if it looks like some of the alpha dogs are hanging around. Don: Oh I am so sorry to hear this. What a terrible way to be spending your final years. And how about Pumpkin? What’s your story? Alex: Yes pumpkin really isn’t doing so well. Poor little sausage was once a pet, supposedly loved and cared for, and a beautiful dog. However with old age Pumpkin got ill and more infirm and the people who called themselves the owners, just threw Pumpkin out like rubbish. Alex: Yes. 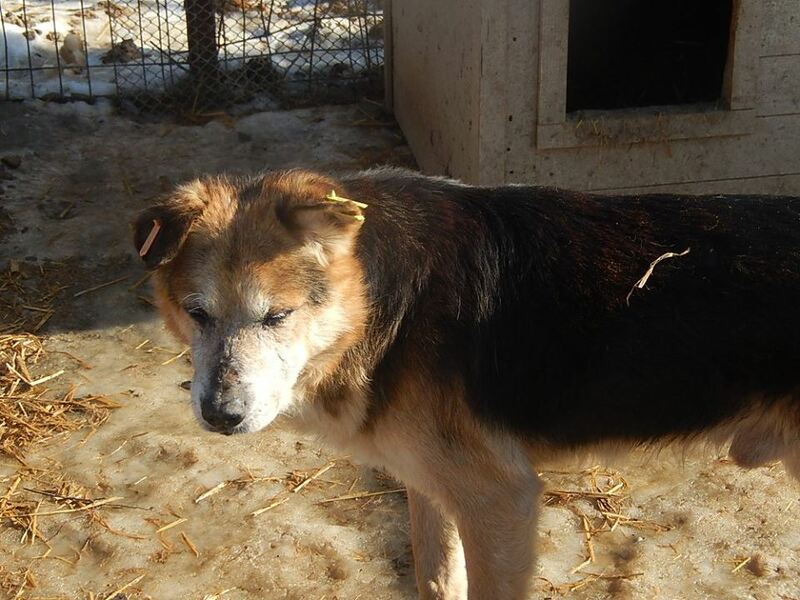 But fortunately for Pumpkin and us other oldies Hope for Romanian Strays is trying to help us. They are covering Pumpkin’s vet bills and are trying to find us homes and have added straw to our kennel so it is a bit warmer and less muddy. Don: Yes they do great work I must say. Aniela works tirelessly every day to try to improve conditions for frail dogs like yourselves. Sadly there is never enough funds to help all the dogs that need help. So now tell me – what are your wishes for 2015? Domino: I dream of warmer kennels – more straw for starters. And a big hug. I’m only little but I have so much love to give. Bobby: I would also love to have a family who loves me for who I am and not for my age. Oreo: Oh yes – and to feel safe again. And to have enough food every day. Jones: I just want to spend my final moments in a warm home surrounded by love. Don: I think these are great dreams to have and let’s hope and pray that people reading this will decide to help make them reality. You are all lovely old dogs, who have been through so much and who are suffering in your final years, living out in the cold and wet, shivering with your old joints aching, and who are not getting enough food. All you want is a warm and loving home to rest your old bones where you get regular food and the love and care you deserve. *Don turns to look directly at you* Can you help these poor old dogs? Will you be another person who just forgets about them? Or will you be the persona to actively help find them a warm home to call their own by sharing this post and their photos and asking friends and family to open their homes to one of these dogs in desperate need?